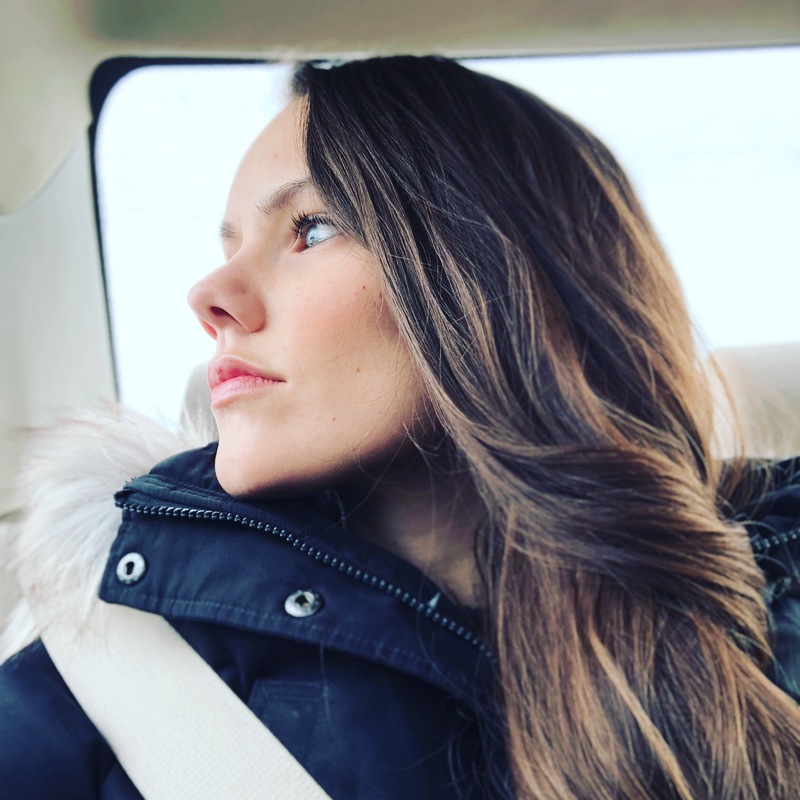 Why we chose to unschool and a glimpse into a day in our life! We have tried many different methods of homeschooling for our son. Workbooks, School at Home, and Classical were utter disasters. Waldorf, and Montessori were improvements but still didn’t quite work as well as hoped. 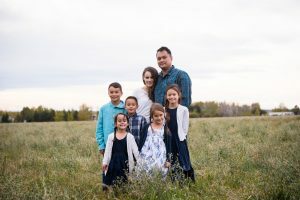 All of these methods of homeschool are wonderful in their own ways. They just weren’t wonderful for my son, because they all tell my son what he is to learn and when he is to learn it. With our son, we just needed to get out of his way and let him learn what he wanted to learn. Let him go to the library and choose whatever books caught his interest. Let him discover his passions. Gabriel is 7 years old. He is inquisitive and tenacious. When he finds a subject interesting he dives head first into it and devours as much information as he can find. So, for example, when he came to me one day saying he wanted to create his own Dinosaur Field Guide, I gave him a binder and helped him navigate the internet. This Field Guide was so much more than just looking up a dinosaur. It encompassed Math, Art, Science, Reading/Writing, Geography, and History! How do we fit in all our subjects when we unschool? Math- He discovered the size of the creature in meters and feet and measured that out so that he could get a visual. Sometimes he compared the sizes of creatures which included adding and subtracting. Art- Gabriel usually recreates the creatures with LEGOs. This is how he learned what Bipedal and Quadrupedal were. He also likes to model with clay and color pictures of the creatures. Science- He researches who discovered the fossils any special attributes the creature had and why? Was it for defense or offense? Was it for mating purposes? Did it have to do with its habitat or environment? Reading/Writing- Well, he is writing a book…so yeah. I remember the first time he read the word Ankylosoraus! I was astounded that he read it so easily. But, I suppose I shouldn’t have been because it was something that interested him. Sometimes reading books lead to new subjects. Such as the book on Climate Change. He was reading it because there was information about the dinosaurs in it, but it also brought up the Natufian Culture, Homo florensis, Leif Erikson, and Hernan Cortes! Guess what he wanted to research that week! Geography- Gabriel wants to know where these animals lived. So I give him the latitude and longitude coordinates and he finds the location on his map. 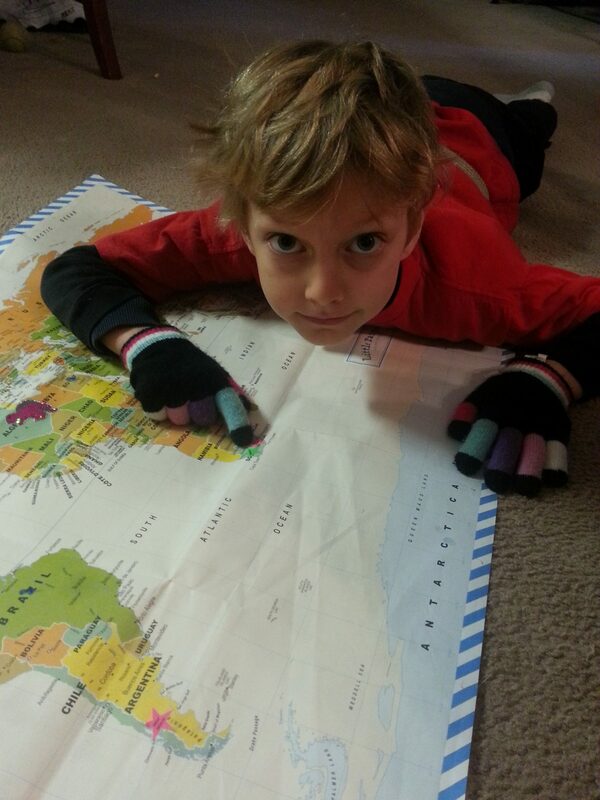 He marks the locations with stickers so he can keep track of where he wants to visit. He also likes to talk about how a place got its name. Patagonia, South America is one such place and it led him to Ferdinand Magellan. He learned about a great many things by asking Who? What? When? and Why? How to unschool when your child isn’t interested: Get Creative! Now there are days where my son doesn’t seem interested in anything but his LEGOs and that’s OK. I do not force him to learn anything. Besides, when he is “playing” with his LEGOs, he is creating pulleys, catapults, levers, buildings, and vehicles. Do you realize how much problem solving goes into that? Gabriel learns additional math by adding up chocolate chips and then dividing them evenly between himself and his little sister, helping me double and quadruple recipes, and he plays games on the internet that are math based. We enjoy playing board games and math based stories as well. I have connected to quite a few scientific professionals over social media who are really great at posting new scientific finds and answering a 7 year olds questions. Such was the case one day when Gabriel was not interested in anything. I saw that a scientist posted something about the Greenland Shark! I thought it was really neat because I didn’t know there was such a thing. So I yelled, “WOW!” Gabriel comes running to see what got my attention. Guess what we learned about that day? Later a shark scientist was having a Q&A over Twitter so we got to ask him questions about the sharks and about being a scientist! Of course we don’t spend all of our time inside. Like any good scientist, Gabriel, likes to be out running, playing games, digging, climbing, discovering and observing. Most days the first thing the children want to do is go outside! We love our Nature Hikes! There is so much to learn about the seasons, habitats, flora and fauna. 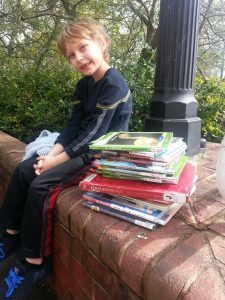 There is so much that my son is learning now because he wants to and that for us is what unschooling is all about. What do you think about unschooling? Have you ever considered it? And yes – SO much to learn with LEGOs alone…. 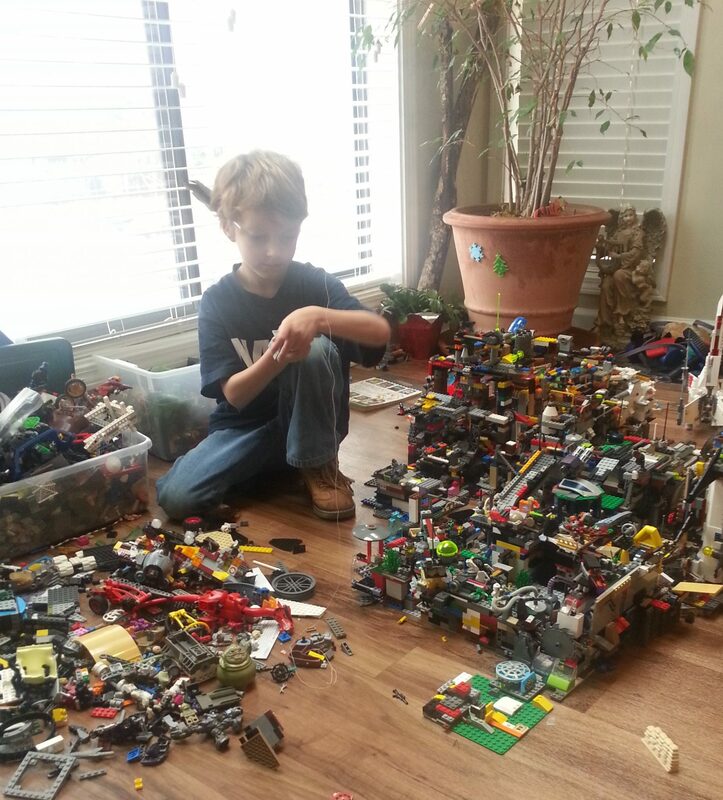 My son’s passion is LEGOs as well – it has been great to see all that he does with them. Great post, Erin – I love how you showed the different categories of learning, because I think a lot of people are stumped by that aspect of unschooling. We don’t unschool completely, but I’m always blown away by what my 7 and 14 year olds are learning in their “off hours”. Sometimes I think we should just go entirely with unschooling. 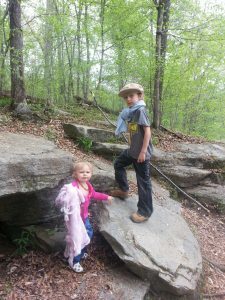 We have newly moved into homeschooling and after a lot of frustration we are currently unschooling. We may move back to a curriculum at some point but we are really appreciating the creativity we are seeing in the kids. We are big Lego lovers, too. I think it’s funny when one of my kids is hollering for everyone to get their chores done so they can go listen to their history CDs. We aren’t truly unschoolers, but more eclectic. Ha! That is funny! Great leadership skills 🙂 I think it’s great that you’ve found what works for you and your kids! It’s late, I meant to say when my “kid is”, not “kids is”….How embarrassing! I just wish my kids were motivated in that way. When given the choice, my kiddos veg out on the coach, watch tv, play video games or surf youtube videos. However, there are things they’ve become passionate about (things that I had to initiate by introducing it in their curriculum) and they spend time exploring those options. 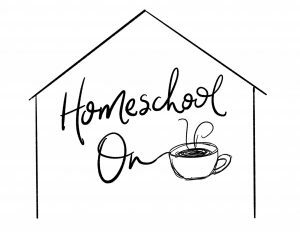 Homeschooling gives us ways to customize education for our kids. I know I’ve remained fluid and allowed the curriculum to be dictated by my kids needs and ability. I do have an end plan to their school year for growth in their learning. Also, I make a plan for testing their retention of a subject. This sounds great to me! I like my son with me, and with his anxiety, he loves being home. My son has autism, so he does get hyper focused on things he loves, so this concept of letting him explore different subjects using things he loves would actually work very well for him. I worry about the legalities of it. He is going into 6th grade. Is this legal? could I get in trouble for taking him out of school and doing this? I was a former foster child, so Im leery and do not trust the system. I too have my own learning disabilities in math and worry that I cant teach him if I do not understand it myself. Hi Terri! Homeschooling is legal in the United States. However, every state is different in regards to laws. 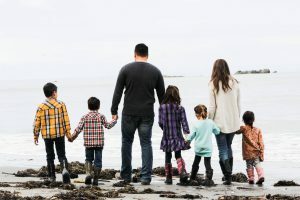 You can look up your state’s homeschool laws here http://www.hslda.org/hs/default.asp and then you work within those laws creating an environment of learning for your son. As for math…if you don’t feel comfortable teaching it….you could get a tutor, he could take an outside class for homeschoolers, even do math online if that works for him!